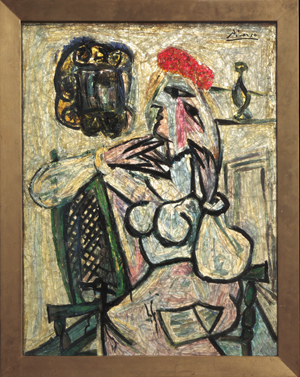 Now it’s a museum in Indiana that has found a treasure lying around in the basement: Picasso’s Seated Woman with Red Hat, dated 1954-1956, has been in storage at the Evansville Museum of Arts, History & Science since it was donated in 1963. Because of a mixup and misunderstanding, no one knew it was a Picasso — even though it was signed! Last week, deciding it was unable to properly secure and show the picture, the museum’s board voted to deaccess Seated Woman with Red Hat through Guernsey’s, the small New York auction house, which plans to sell it privately (about which more, below). Seated Woman with Red Hat was created using a layered-glass technique called “gemmail” (plural: gemmaux). Gemmail uses individual pieces of color glass overlapped and joined together with clear liquid enamel and then fired. …Picasso…produced 50 or more gemmaux masterpieces during his two years of study at the Malherbe Studio in France. Picasso gave one-half of his collection to the Malherbe family in return for their expertise, training and collaboration, and kept one half for himself. The pieces in Picasso’s portion of the collection were sold to private collectors [including, the museum added later, the Emperor of Japan, Nelson Rockefeller and Prince Rainier of Monaco]. …associated documentation indicated that the piece was created by an artist named “Gemmaux” – confusing the name of the technique with the artist’s name – and that it was a design inspired by a Picasso painting, which is how it was cataloged by museum staff. It was noted that the piece was signed by Picasso. The piece was placed in museum storage and never displayed. Earlier this year, Guernsey’s, in researching Picasso’s gemmaux works, contacted the Evansville Museum about the gift from Raymond Loewy. It was this contact from Guernsey’s that revealed the significance of the piece, prompting further research and study. Loewy died in 1986, apparently never asking why his gift wasn’t on display. Although the museum says it doesn’t want to pay the additional expenses associated with showing the picture, this is a curious excuse for deaccessioning. The museum also owns five works on paper by Picasso, and two are on view in an area it says is “devoted to portraits and figure studies.” It has what appears to be an extensive collection of art that requires security: “American and European painting, graphic works, and sculpture dating from the 16th through the 20th centuries.” It mounts temporary exhibitions. It owns, according to one published report, works by Rembrandt, Hopper and O’Keeffe. Its most recent 990, for 2010, shows net assets of more than $20 million and an operating surplus that year of $461,225. It’s accredited by the American Association of Museums. Neither the museum nor Guernsey’s have placed a value on the portrait, which was based on Picasso’s 1934 Woman With a Red Hat. But that is what appears to be the motivation for selling, doesn’t it? The message to patrons is clear: don’t give this museum anything too valuable; we’ll have to sell it. Not a way to build a collection. raters so the work languished in the cellar – once established as a Picasso it becomes a “jewell ” of a work. From the top down they should all be out on the street looking for work . You would think that they would be embarrassed by the incompetence..
What a find worth alot of money! And now, with probable poor security and great internet coverage, there is a high probability of a theft. A small sleepy Indiana town is easy prey for a professional art heist. Do you think that the sale and choice of auction house had anything to do with this? Despite the picture alleged to validate its authenticity, I am not convinced this is even a real Picasso. Rather, I subscribe to the original belief that this is a work inspired by Picasso, but likely performed by its donator, Raymond Loewy, who himself was a commercial artist. There is another work by Picasso called Seated Woman with Blue and Red Hat which is very similar to this.